Our annual World Wide Wrap takes place on Sunday morning from 9 - 10:30. Our B'nai Mitzvah class families attend, along with any other congregants who wish to learn more about the core Jewish ritual of tallit and tefillin. For me it's especially gratifying to see girls trying them on for the first time. Sadly, fully a half century after the advent of modern feminism, some are still convinced that such rituals are not appropriate for women. ...and Be Happy - our most joyous month, Adar begins this Tuesday and Wednesday - and this year, we have two Adars - it's a Jewish Leap Year. In a leap year, Adar is our Mulligan Month, an entire month that we get to do over. Yahrzeits can get confusing (ask me if you have a question - they are usually in Adar 1, unless your loved one died in Adar 2 - but really. Ask.) and Purim is always in Adar 2, but otherwise, we’ll have two of all things Adar. 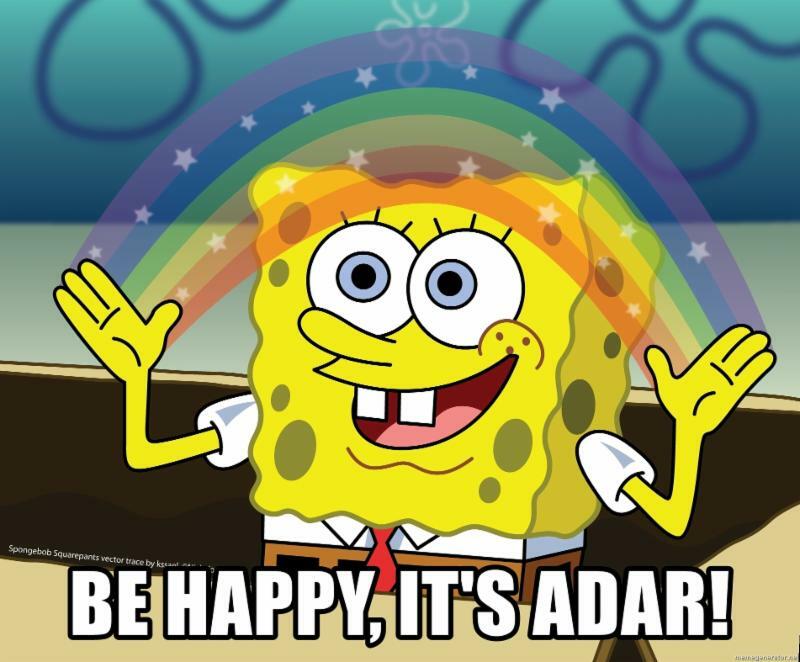 Since Adar is our most joyous month, we get a double dose of happiness, just what the doctor ordered in the midst of a polar vortex. Adar will be doubly good, and Purim will be late. 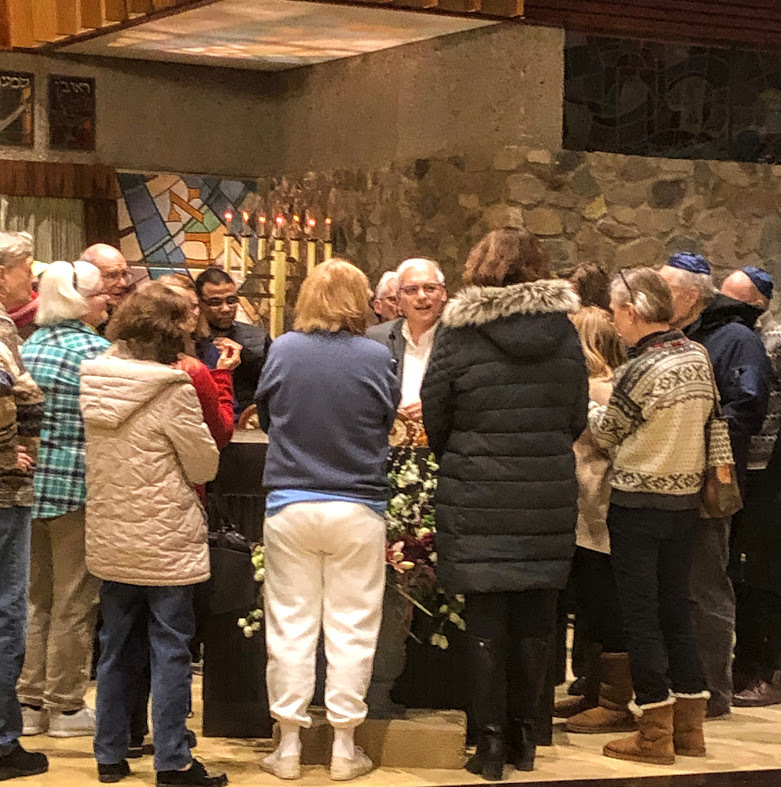 As we look forward to Temple Rock on Saturday night (and pay close attention during the live auction for a surprise announcement), services on Friday night and Shabbat morning will be in the sanctuary. Cantor Fishman and I would love to see our streak of excellent attendance and high spirits continue. Here's a sneak preview of tomorrow's study packet. At services we'll be discussing how we all can get along. It's been a busy week here, and a very satisfying one. Last Shabbat Ben Kassel became Bar Mitzvah - read his speech on the Ten Commandments of Soccer. And despite the wintry weather, we've had three well-attended adult ed classes. 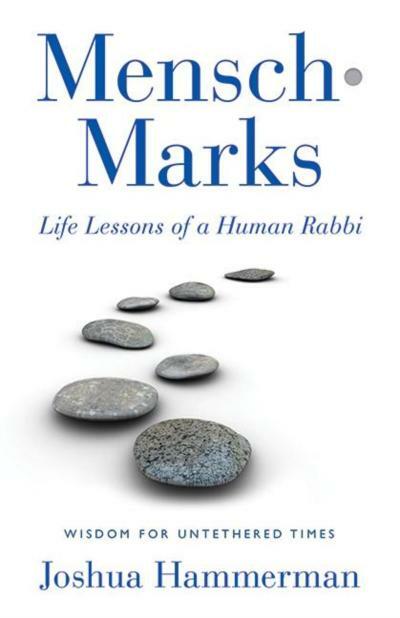 Yesterday, about 25 came to the weekly class where I preview various chapters of Mensch·Marks. This week's topic was civility and gossip (based on Mensch·Mark 35: Championing Civility: It's Impossible to Avoid Gossip but Essential to Try). Our lively conversation touched on lots of contemporary topics related to the destructive and healing power of words. You can download the supplementary study packet here. Last night we hosted the Interfaith Council series on Wisdom Literature and I spoke about two of the most subversive books in the Bible, Esther and Ecclesiastes. Around 75 people came, a marvelous melange of Christians, Jews, and at least one Muslim. Before the lecture, I invited our guests up to the pulpit for a close look at the Torah scrolls - and they asked terrific, probing questions. It was a great week for loving our neighbors! ז וּרְאִיתִיו מַגִּיעַ אֵצֶל הָאַיִל, וַיִּתְמַרְמַר אֵלָיו וַיַּךְ אֶת-הָאַיִל וַיְשַׁבֵּר אֶת-שְׁתֵּי קְרָנָיו, וְלֹא-הָיָה כֹחַ בָּאַיִל, לַעֲמֹד לְפָנָיו; וַיַּשְׁלִיכֵהוּ אַרְצָה וַיִּרְמְסֵהוּ, וְלֹא-הָיָה מַצִּיל לָאַיִל מִיָּדוֹ. And I saw him come close unto the ram, and he was moved with anger against him, and smote the ram, and broke his two horns; and there was no power in the ram to stand before him; but he cast him down to the ground, and trampled upon him; and there was none that could deliver the ram out of his hand. Sounds like this ram was sacked! Looks like a Big Day for the Patriots' D.
As rumors of tonight's opinion polls began to circulate, the feeling that something had changed began to grow. This evening Channel 13 published its polling results and Gantz has gone from 12 to 24 seats in one day. Moreover, when those surveyed were asked who would you prefer to be Prime Minister, Gantz was tied with Netanyahu. This is first time anyone other than Netanyahu has received such strong poll numbers, since Barak beat Netanyahu. What accounts for Ganz's popularity and the degree of his threat to Netanyahu's decade-long reign? First and foremost, he's solid on security. As a general he cannot be painted as a "lefty," as Bibi is trying to do, and on social and religious issues, he has come out strongly on the side of inclusion, even advocating for the reneged Western Wall deal that would have brought multiple prayer opportunities to our holiest site. Oh yes, and he also supports two states and a rollback of the controversial (and unnecessary) Jewish Nation-State Law. And finally, he's calling out corruption in government, affirming that he would never be part of a government run by a Prime Minister under indictment. So if Ganz is not a flash-in-the-pan, and especially if indictments are forthcoming for the Prime Minister, this will get very interesting as the election season heats up. Beyond the immediate moment, there are long term concerns about Israel that need to be addressed. There is no question that many American Jews, particularly younger progressives, have become apathetic (or worse) toward the Jewish State. Part of the reason for this is that Israel has appeared to be slipping away from some of the key values that so many Jews affirm. * I believe Israel must be a Jewish and democratic state. * I embrace Israel’s Declaration of Independence, and its commitment to the Jewishness of Israel, her democratic character, and human rights for all her citizens. * I am a supporter of settlements, but my government will promote settlements in such a way that Israel’s Jewish and democratic essence will not be compromised. * Jewish terror is an abomination and a profound affront to Jewish values, and Jews who engage in terror will be pursued and apprehended by our security forces and punished to the full extent of the law. * I am deeply concerned by the troubled relations between Israel and world Jewry, and while I understand the concerns of the Orthodox parties and hope to see them in my coalition, I will make it a top priority to repair the bonds that connect us to the non-Orthodox movements and to the Jewish people everywhere. * The current situation in Judea and Samaria imposes significant burdens on Palestinians, and Israel will do everything in her power to minimize those burdens. * The horror of the Holocaust is forever imprinted in our memory, and the State of Israel will never cooperate, directly or indirectly, with European governments intent on distorting Holocaust history and minimizing their responsibility for the slaughter of Jews. * I strongly support the law affirming that Israel is the nation-state of the Jewish people, but I have heard the concerns of the Druze community and others, and I will take steps to guarantee equality and human rights under law for every Israeli citizen. * There may not be a partner for peace at this moment, and there can be legitimate disagreement about how peace can be obtained, but any government that I head will remain actively committed to making peace with the Palestinians and all our Arab neighbors, and to the task of building with them a future together. I hope Yoffie isn't holding his breath, because during an election campaign Bibi will be appealing primarily to his base and is unlikely to say any of this. But it doesn't mean we need to remain silent. As the Israeli elections approach, world Jewry has a chance to provide the next government of Israel a way toward realizing the goal of Israel being a truly Jewish and democratic state. To demonstrate the breadth of concern for Israel's democratic and Jewish future among Jews worldwide, a campaign to garner 10,000+ signatures on "A Vision Statement: Israel as a Jewish and Democratic State" is being launched by Ruach Hiddush, a trans-denominational coalition of Rabbis and Cantors. The Statement, co-written by an Israeli Reform and an American Orthodox rabbi, presents a concrete plan that insures that the country's democratic and Jewish values remain the essence of all that Israel is. Join with religious and community leaders, intellectuals and philanthropists in support of the Revivot Yisrael Campaign - and sign the statement, as I already have, and add your voice to the large and growing number of Jews in every corner of the world who share this vision of unity through diversity. To sign, click on this link. The campaign is the being sponsored by Hiddush, whose leader, Uri Regev, spoke here not long ago. 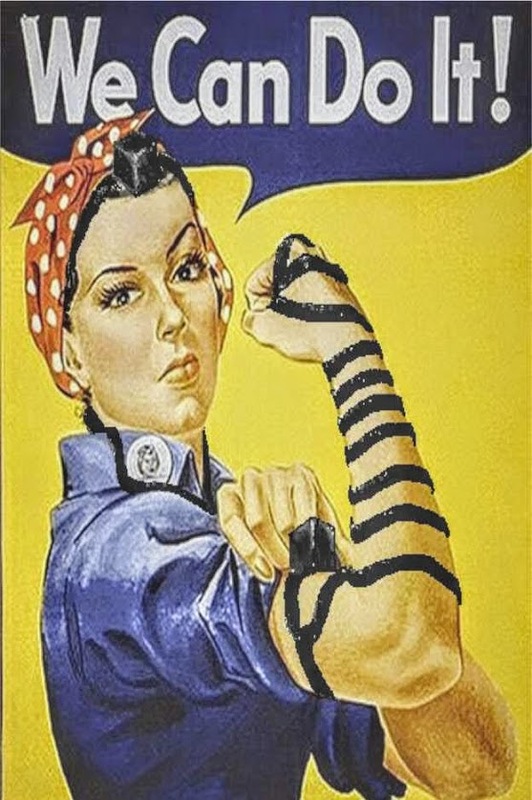 I truly believe that this is a time for American Jews to reengage with Israel, even where there is disagreement. Change happens - but only when people care enough to act. A month ago, Israel's most prophetic voice since Jeremiah, Amos Oz, passed away. 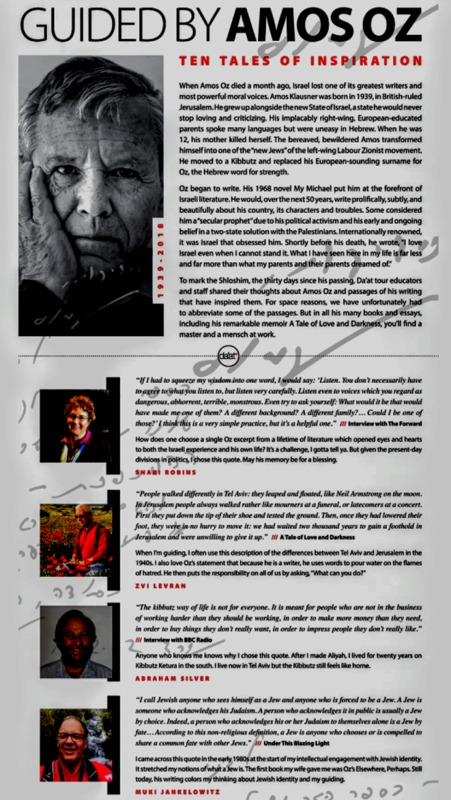 To commemorate the thirty day anniversary of his passing, Da'at, a travel company, put together a collection of quotes by Oz. Now, Israel is a fulfillment, and as a fulfillment, it is flawed. The fact that it is flawed is not so much a testimony about the failures of Israel. No, it is a testimony about the nature of dreams. The only way to keep a dream, any dream at all, to keep a dream perfect and rosy and intact and unsullied is never to live it out. The moment you carry out any of your dreams or your fantasies-travel around the world, climbing a high mountain, buying a new house, writing a novel, carrying out a sexual fantasy, traveling to an unknown country-the moment you carry out your dreams, it's always, by definition less perfect and rosy than it had been as a dream. This is the nature of dreams. And Israel-let's not forget it-Israel is a fulfilled dream.